In late September, Irish America designer and photographer Patrick Cahalan took a CIE seven-day tour of Ireland. The photos in the next few pages give a taste of his experiences on his first trip to Ireland. Beginning in Dublin, our CIE Tour visited the Guinness and Jameson breweries, Phoenix Park and the city center. 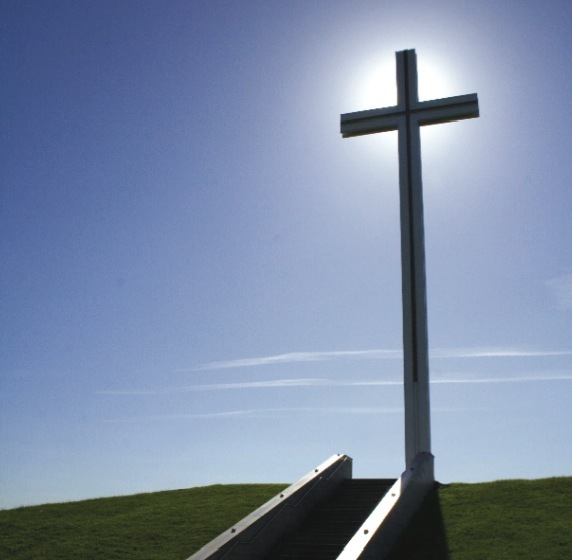 The Phoenix Park photo (right) shows the cross that was erected on the spot where Pope John Paul II celebrated Mass in 1979 to over a million people. Below left is a photo of the Famine memorial at Custom House Quay in the center of Dublin where 35 life-size bronze statues by sculptor Rowan Gillespie haunt the sidewalk. Leaving the capital, our next stop was the Abbey Tavern in Howth, County Dublin, where fine food and even better entertainment awaited us after our busy day in the city. The following morning, rested and replenished, we continued on to the Rock of Cashel, the famous castle in Tipperary, where Brian Ború was crowned King of Munster in 977. On we forayed through Cork City down to Kinsale, always educated and entertained along the way by knowledgeable tour driver, comedian and guide Lorenzo Daly. Kinsale is famous for the Battle in 1601 and more recently as a must-visit area for gourmands. It is also stunningly beautiful. After a hearty dinner, we were treated to a light–hearted ghost tour by the folks from the Tap Tavern. The contrast between Kinsale’s narrow, dark streets and the humorous way in which the tour was presented made the evening both memorable and unique. The following day, after a brief coach tour which highlighted the history of Kinsale, we made our way north to Blarney Castle where hundreds of people were already lined up to kiss the Blarney Stone with all its fabled powers. If only every kiss paid such dividends! Our next stop was Killarney. Kerry’s victory in the All-Ireland Football Final had the town in good spirits. Our driving tour through the Ring of Kerry was blemished by bad weather, but Lorenzo kept everyone amused and informed with uniquely Irish stories and jokes. The weather had its way with us again the next day as we visited the Cliffs of Moher in County Clare. But even seen through fog and rain, the Cliffs are stunning. The minor discomfort of being soaked head to toe was a small price to pay for the experience of seeing such a vast and beautiful sight with my own eyes. On our way to Galway Bay where our tour concluded, we stopped briefly in Moycullen at the Connemara Celtic Crystal Factory. The elaborate and intensely detailed beauty of the crystal was symbolic of my entire trip. The entire tour from start to finish was perfectly arranged by CIE Tours. The itinerary struck the perfect balance between guided activities and free time. Our hotels were first class, from the staff to the food to the rooms themselves. The bus was incredibly comfortable and made even more so by the knowledge, humor and courtesy of our driver Lorenzo Daly. The privilege of being able to experience Ireland first hand was a great reminder that a place as beautiful cannot be truly enjoyed through the written word or photographs. It must and should be experienced in person. Do you have a contact for Patrick Cahalan who contributed this article?